When is a new truck not entirely new? When it’s a 2019 Ram Heavy Duty. Instantly familiar, especially when viewed from the rear, your eyes do not deceive. The new Ram HD is a heavily upgraded old Ram HD, with new frames, axles, drivetrain components, styling and interior changes, and more. When this big rig goes on sale, it will come in Tradesman, Big Horn (Lonestar in some regions), Power Wagon, Laramie, Laramie Longhorn, and Limited trim levels with a choice of cab styles, engines, drivetrains, and much more. Forward of the doors and windshield, the Ram HD is redesigned, retaining the look of an over-the-road semi but with styling that aligns with the all-new 2019 Ram 1500 light duty truck. Ram also gives each trim level a unique appearance through grille, wheel, and trim detailing. From the windshield and doors back, the new Ram HD looks a lot like the old Ram HD. New taillights, tailgate, and rear bumper designs add freshness, and the popular RamBox option continues, now featuring a 115-volt/400-watt outlet and lighting for improved nighttime visibility. Speaking of lighting, there are three different headlight designs, including an adaptive front lighting system. They help drivers to see the way after sundown, the Ram slipping through the atmosphere with a drag coefficient of .41 (that’s low for a truck like this). Inside, the Ram HD gets a redesigned interior with improved materials, new colors, and more sophisticated textures. High-end trims are even available with a leather-wrapped dashboard. The truck is quieter than before, too, thanks to acoustic glass, active noise cancellation, and anti-vibration efforts. The Ram’s climate system boasts controls that are easier to use when the driver is wearing gloves, in addition to a 30% improvement in airflow. With one of the diesel engine options, the Ram HD gets new in-duct heating elements to warm the cabin sooner than later. A new center console design supplies 12 different storage configurations and 22.6 liters of capacity. A wireless charging dock is available, along with up to five USB ports including USB-C fast chargers. Up to three 115-volt household plugs are on board, and they all handle 400 watts to charge or to power tools. In terms of total in-cab storage, the Mega Cab version of the truck offers twice the capacity of the closest competitor. New frames provide the foundation of the 2019 Ram Heavy Duty, constructed of 98.5% high-strength steel for reduced weight, greater torsional rigidity, and improved capability. These, and other, changes reduce weight by up to 143 pounds over the outgoing truck. A 6.4-liter V8 engine is standard, making 410 horsepower at 5,600 rpm and 429 lb.-ft. of torque at 4,000 rpm. This “Hemi” V8 is paired with a new 8-speed automatic transmission actuated using a rotary dial on the dashboard. Two Cummins turbo-diesel engines offerings are available, both inline sixes displacing 6.7 liters. The first makes 370 hp at 2,800 rpm and 850 lb.-ft. at 1,700 rpm. It is bolted to an upgraded 6-speed automatic with improved shift quality. A Cummins High Output engine provides top towing and payload capacity in the 3500 HD, making 400 hp at 2,800 rpm and 1,000 lb.-ft. of torque at 1,800 rpm. So equipped, a 3500 HD tows up to 35,100 pounds and carries up to 7,680-lb. payload. This engine includes a 5-year/100K warranty, and employs a specific Aisin-sourced 6-speed automatic transmission. Four-wheel-drive is available, with a manual or automatic transfer case. The Cummins High Output engine uses a specific BorgWarner transfer case designed handle the engine power and towing capacity. A new braking system equips the truck with upgraded calipers, a new master cylinder, and a new booster for better brake feel and shorter stopping distances. New front and rear axles are claimed to improve durability and reduce noise, vibration and harshness, while a reworked suspension switches to frequency response damping shocks and progressive springs. The 2500 HD continues with a 5-link coil rear suspension design, while the 3500 HD has a Hotchkiss rear leaf spring design. An available active rear air suspension offers Normal, Payload, Trailer-Tow and Bed Lowering modes. 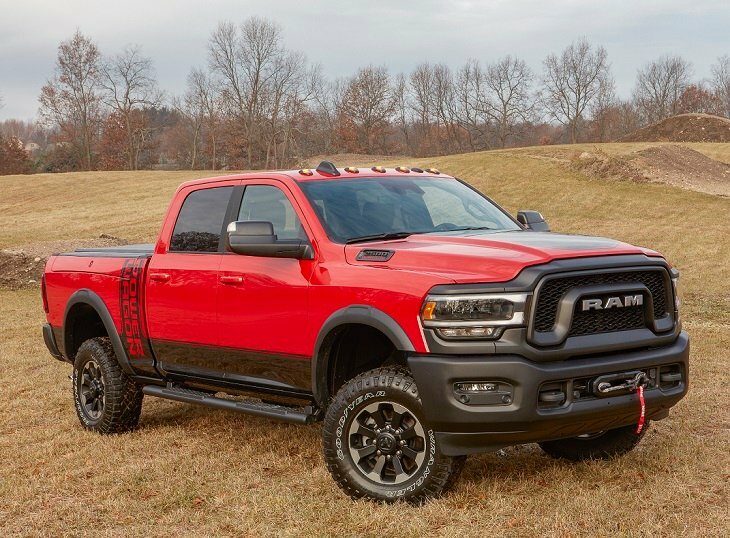 The Ram 2500 HD Power Wagon returns for 2019 with its special factory-lifted suspension, locking front and rear differentials, disconnecting sway bar, and 12,000-lb. winch. A 360-degree camera is new for the Power Wagon, with forward-view gridlines to help navigate difficult terrain. Ram continues to offer the Power Wagon treatment with simple Tradesman exterior trim, providing a basic looking but capable truck. Two rear cameras are standard for the new Ram HD. The first is a reversing camera embedded into the tailgate handle. The second is mounted at the back of the roof and shows the cargo bed, allowing a driver to keep an eye on payload and to more easily connect a gooseneck or fifth-wheel trailer. Additional safety upgrades include available adaptive cruise control, forward collision warning with automatic emergency braking, and automatic emergency braking with the trailer brakes. As far as the Ram HD’s infotainment system is concerned, standard equipment includes a basic Uconnect setup with a 5-inch display. The upgrade from this is Uconnect 8.4, which provides a wider range of features – including smartphone integration, satellite radio, and more – along with a larger 8.4-inch touchscreen display. The top infotainment system is the same Uconnect 4C Nav equipment that debuted in the Ram 1500. It has a 12-inch configurable touchscreen display with a split-screen view, and supports a new SiriusXM 360L customized listening experience. A 17-speaker Harman Kardon sound system is available with this infotainment system. Practical technologies include a new 360-degree surround view camera with trailer reverse guidance view. It provides a single display view of both sides of the trailer to help when maneuvering. Additional trailering assist functions include a new auxiliary camera system that improves visibility through custom positioning on or behind trailers, and an advanced trailer tire pressure monitoring system that stores up to four different trailer profiles and can measure up to 12 trailer tires. Rear parking assist sensor for the Ram 3500 are specially designed to provide broader coverage in order to account for the width of the dual rear wheels.